A podcast about finding out if two halves of a movie really do make a whole. 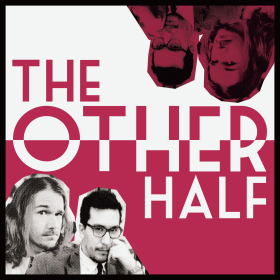 Created and hosted by Mike Trujillo and Ethan Hawkes, The Other Half is a podcast where each week the duo picks a movie, watches two different halves of the same movie and then tries to piece it together. It’s a comedy/movie podcast like you have never seen before. Ethan and Mike watch the very ’90s movie GO. It’s got bad hair, Katie Holmes and a nonlinear drug/crime plot.